These are photographs I took this morning of some of the plants blooming in our garden. 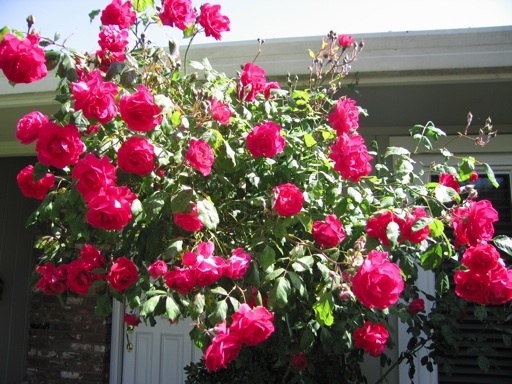 This is a photo of our Blaze climbing rose. I planted it as a bare root rose about 7 years ago. It’s so heavy with flowers and new growth right now that it’s about to fall over. I forgot to prune it last winter, which really needs to be done to reduce it’s new growth in the spring. Now I’ll either have to cut off many of it’s flowers and buds to keep it upright or add a new support to it. This is a photo of one of the many California poppies growing in our yard this year. 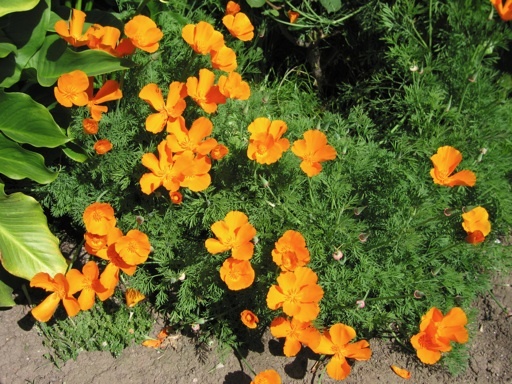 I planted a California poppy transplant I bought from a nursery several years ago. A few new seedlings sprouted from that plant, but each year we had less and less of them. Last year, a few of the seedling grew and bloomed more than in the past. Those few plants must have spread their seeds widely, because this spring, poppies are growing all over our backyard. Our yard is covered with bright orange flowers, and they look amazing. 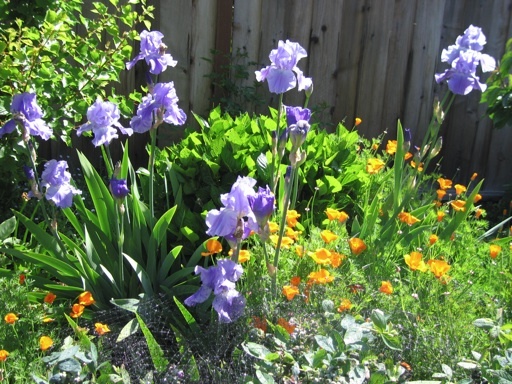 This is a photo of some lavender blue bearded irises that we’ve had in our yard for a long time. They bloomed for the first time last year, and they have even more flowers this spring. I attribute that success to the fertilizer my partner has been putting around the hydrangea that is growing behind these irises. This is a photo of a Sensation lilac bush that is blooming in our yard. I bought this bush last year from a nursery, because I was enthralled by the look of the flowers, which each have a deep lavender center and a white border. 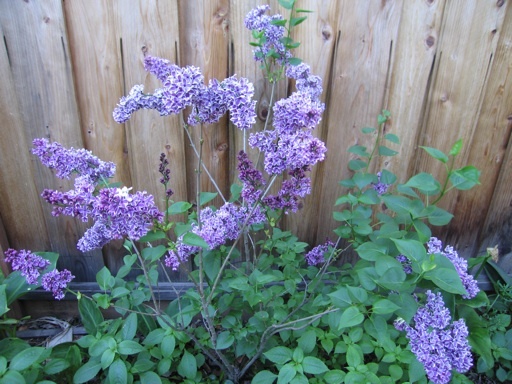 This is a French hybrid lilac which is supposed to bloom best after a cold winter. Although last winter seemed chilly to me, I didn’t know until about a month ago when the buds started coming out if our climate was cold enough to stimulate this lilac to bloom. Last spring, our lilacs had very few flowers. We fertilized them with an all-purpose fertilizer 2-3 times last spring and summer to try to get them to bloom more. This spring all of our lilacs except one are covered with flowers.